Mix, Mingle, Murals returns July 18th! What: A casual networking event for anyone involved or interested in mural art. A casual evening of connection for anyone involved or interested in mural art. 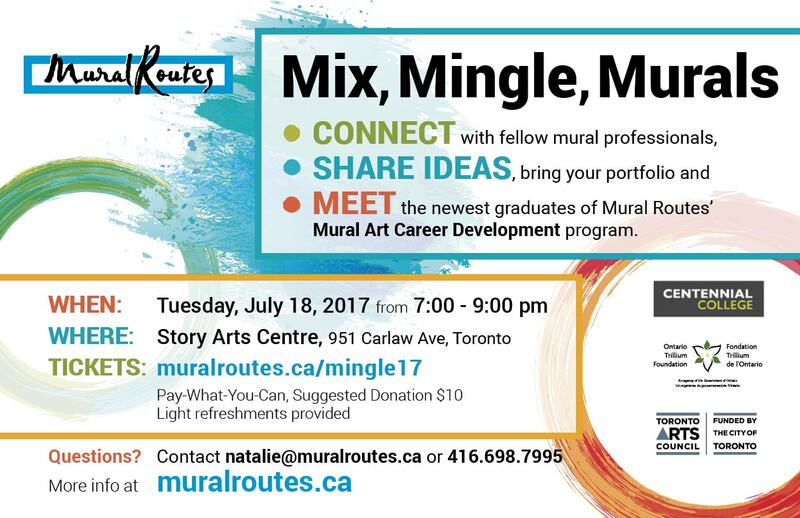 Join us to connect and share with fellow mural artists and administrators, including the newest graduates of Mural Routes’ Mural Art Career Development program. Share ideas, find potential collaborators, and enjoy! Don’t forget to bring business cards, your portfolio, and any other material that you would like to share. Refreshments will be provided. This event is Pay-What-You-Can (suggested donation: $10). Donations can also be made at the door. Don’t forget to RSVP.